PREEvision offers design functionalities especially tailored to designing FlexRay systems. It´s convenient, easy-to-use interface lets you create and edit the systems efficiently. CANalyzer .FlexRay is a universal tool for analyzing distributed real-time systems. It covers all use cases from simple network analysis to well-directed error localization in complex problem situations. CANoe .FlexRay is a comprehensive tool for developing, testing and analyzing entire ECU networks as well as individual ECUs. It supports you over the entire development process in developing applications with real-time relevance. In testing ECUs, it may also be necessary to connect I/O interfaces to the test system along with connecting the communication networks. Vector´s VT System is used to perform this task. It simplifies test bench setup tremendously by integrating all of the components needed to electrically connect an I/O channel in one module. Loggers of the GL4000/GL5000 product line perform magnificently in logging data on the FlexRay bus. These loggers receive and save the bus traffic and support later data analysis with log files. In testing and validating FlexRay systems, it is necessary to study system behavior in response to errors and disturbances more precisely. FRstress is used to generate reproducible disturbances on a channel in the FlexRay cluster. Users can have protocol errors and bus physics disturbances generated and activated by trigger conditions. CANape is a versatile tool for developing, calibrating and diagnostics of ECUs and acquiring measurement data. Along with observing the FlexRay signals, you can measure and calibrate internal ECU parameters directly over XCP-on-FlexRay. CANdelaStudio is a specification tool and a central block of the CANdela approach that supports you in defining and editing ECU diagnostic data and diagnostic functionalities. Data is specified in an XML database. This data is then available for the following process steps: implementation, validation and testing. CANalyzer lets you observe and analyze the diagnostic communication between ECUs and diagnostic testers conveniently and easily. The transmitted diagnostic data is shown on the Transport Protocol level and is symbolically interpreted based on information from CANdela or ODX diagnostic descriptions. CANoe supports you as a diagnostic tester in all phases of diagnostic development in FlexRay ECUs. The tool offers many different functions, including easy ECU access from the Diagnostic Console, reading out the error memory, fully automated calibration testing with XML or CAPL test modules, and much more. CANoe provides special windows as well as testing and report functions in each of these use cases. Vector´s FlexRay interfaces are powerful hardware interfaces for accessing FlexRay networks. 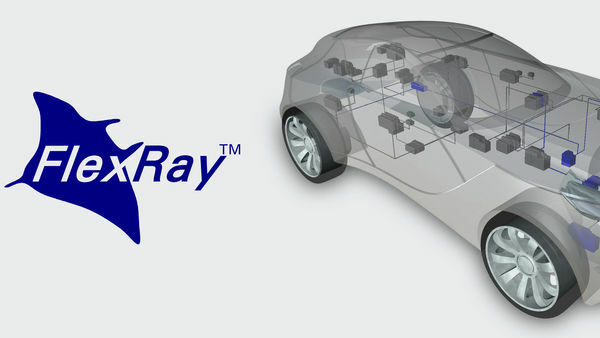 These FlexRay interfaces let you flexibly analyze and test FlexRay networks and ECUs and implement gateway applications with CAN, LIN and MOST. The FlexRay network interface VN7572 is ideally suited for the development, simulation or testing of FlexRay networks via the PCIe interface. The versatile channel combinations for the bus connections to FlexRay, CAN FD and LIN (K-Line) makes it an ideal interface for the laboratory or developer workstation. The VN7610 is ideally suited for the development, simulation or testing of FlexRay networks. The connection possibilities via USB make it universally applicable - for example in the laboratory or during a test drive. Due to its very compact design the VN7610 is especially suitable for mobile applications. In addition to FlexRay bus connection, the interface provides access also to CAN FD bus systems. The VN7640 interface is a flexible solution for FlexRay, CAN, LIN, K-Line and J1708 applications. Additionally, different use cases are supported for Ethernet. The various channel combinations for the bus connections makes it an ideal interface for the laboratory or developer workstation. Due to its compact and robust design, it is alsosuitable for mobile applications. The VN8900 network interface is a modular designed interface hardware with various possible channel combinations for CAN FD, LIN, FlexRay, J1708 and K-Line. A particular focus here is on parallel access to multiple bus channels and I/Os with high requirements on real-time and latencies also in standalone operating mode. The FlexRay bus transceivers are interchangeable piggyback boards ("piggies") and offer a flexible connection between the Vector network interfaces and the FlexRay bus system. MICROSAR.FR includes AUTOSAR basic software modules to handle communication in FlexRay networks including partial networking. It contains the following BSW modules defined in the AUTOSAR architecture: FRIF, FRNM, FRSM and a choice between FRTP and FRISOTP. MICROSAR.FR can be extended with XCP. Vector Controllers are ECUs that can be used universally for vehicle communication. They are perfect for rapid development of functional samples and use in small series productions. The ECUs cover a broad range of applications. You can get an optimal solution for your needs from the scaled product family and by ECUs with reduced PCB population. The Vector Controllers in the automotive product family have been conceptualized for use in 12 V electrical systems. Starting with gateways and extending to domain controllers, the product family lends itself to a broad spectrum of potential use cases. The VC121-12 offers many communication interfaces for CAN, LIN, FlexRay and Ethernet as well as IO interfaces. Therefore it ideally suited as gateway ECU. Regarding FlexRay, the ECU contains one dual channel end node. The clearly structured DIN A1 wall poster provides you with important technical details on the FlexRay message structures and more. You are provided with the most important innovations with regard to ISO 17458 for FlexRay in compressed form. FlexRay in theory and practice: This workshop teaches you the fundamentals of the time-triggered bus system FlexRay. You will also learn about the goals and potential uses of FlexRay as well as the basic principles and technical terms of the protocol. Using the Vector tool CANoe/CANalyzer .FlexRay you will work on a real cluster and conduct measurements, evaluations and simulations. Practical work using a test ECU round out this workshop. This E-Learning module is intended for all those who wish to gain a better understanding of FlexRay communication technology. It is also ideal for those planning to participate in the FlexRay workshop of the VectorAcademy. It lets you learn about the basic properties of data communication in a FlexRay network in advance of the workshop. This not only simplifies your entry into the workshop. Much of what you have acquired by E-Learning will be revisited in the workshop, and this reinforces what you have already learned.